This past weekend I had a girls' weekend here, and we watched a bunch of movies including Miss Potter (about Beatrix Potter, the author/artist). If you have any interest in the Potter books, or in a love story, you should rent it. It brought back memories of going to our local library (a big, old stone house) as a child. I loved to go down to their basement to find all of the Potter books, which were miniature in size and fit perfectly in my hands and crinkled from their clear plastic library covers. It was then that I decided they were my favorite books. I love 'Miss Potter' - such a sweet movie. 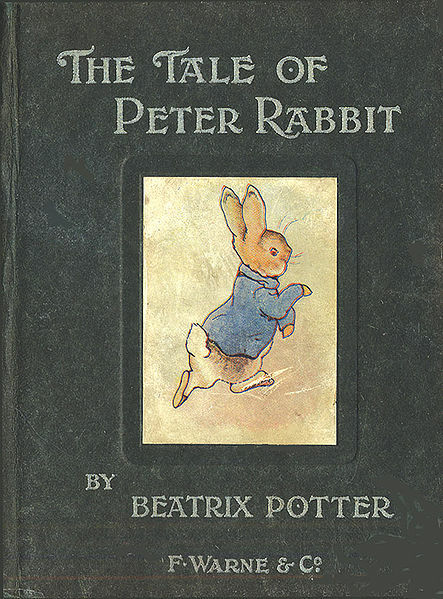 The 'Peter Rabbit' series are gorgeous - I bought some recently for my nephews for their Christenings. I saw the movie Miss Potter. I really liked it. My son had some of her books when he was young also. He really liked Peter Rabbit. I forgot to let you know that I recieve the package you sent in the mail. It is so cute. You are pretty creative. Thank you so much. I'm looking for ways to use those wooden stars. I loved that movie! Just saw it myself a few months ago. Loved watching the story about the artist... I was lucky enough to work on some projects with her Beatrix art this last year and that was such a treat! It made watching the movie so special. I just finished Miss Potter, Alli. I love that movie! I am thinkng about purchasing my own copy. I saw part of it on tv once and finally rented it from Netflix to see the whole movie. It is so heartwarming.